Gwen Stefani opened the elimination show with her team members Anita Antoinette, Ryan Sill, and Taylor John Williams. They sang “The Tide is High by Blondie. Then host Carson Daly delivered some very important news for ‘Voice voters – anybody eliminated from this elimination show onward, after the Top 3 is announced later in the season, everyone eliminated from the Top 12 will be coming back to compete for America’s vote. They will perform one last time and the artists with the most votes will become the 4th “wild card” finalist. The results from the Top 12 live performances from Monday’s show will be announced tonight based on America’s votes. Viewers will also get to “Instant Save” an artist in the bottom three at the end of the night via Twitter. The first revealed as saved was Matt McAndrew from Team Adam. The second artist saved by America’s votes was Team Gwen’s Anita Antoinette. After the commercial break, Daly talked to the coaches. He asked Adam if he thinks all three of his artists will get thought. He said he’s never had a night where his whole team were equally solid and amazing. Out of the Top 12, half of the members have been on Gwen’s team. She said she’s very nervous about eliminations tonight. Pharrell is bringing-in Diana Ross as his adviser to help out the Top 10. Some of the other mentors helping out next week will be Colbie Caillat , Meghan Trainor , Patrick Stumph from Fall Out Boy. Blake said from week-to-week people will see ups-and-downs and hopes America can see their hearts. The next artists announced as safe were: DaNica Shirey from Team Pharrell, and Craig Wayne Boyd from Team Blake. Next, 18-year-old finalist from “The X Factor UK” Ella Henderson performed her hit single “Ghost” live on “The Voice” stage. After her performance, Daly revealed another two artists moving on to the Top 10 – They were Damien from Team Adam, and Reagan James. Team Blake’s Regan James, Jessie Pitts, and Craig Wayne Boyd performed Elton John’s “Sad Songs Say So Much” with their coach Blake Shelton. Then, Daly announced the next three artists staying – Taylor John Williams (Team Gwen), Chris Jamison (Team Adam), Luke Wade (Team Pharrell). The Bottom Three: Jessie Pitts, Sugar Joans, Ryan Sill had the least of America’s votes which meant they had to perform to fight for the last remaining spot in the Top 10 in order to stay in the competition. 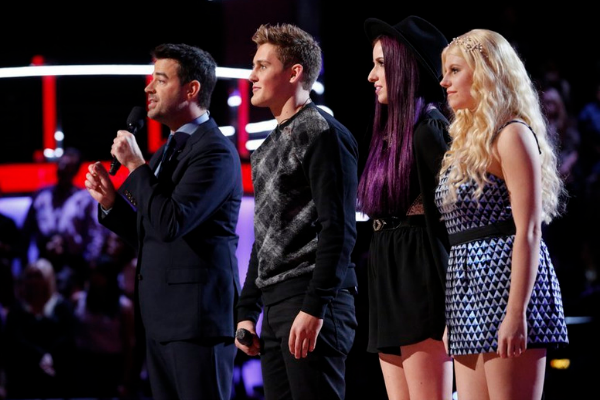 They performed on “The Voice” stage for the Instant Save vote from fans who voted for their favorite via Twitter. Jessie Pitts from Team Blake sang “Gravity” by Sara Bareilles. Blake said he’s never had the opp to work with someone as sweet as Jessie. “Someone like Jessie is very important to this competition because Jessie occupies a space that no one else occupies. Sugar Joans from Team Pharrell sang “I Wanna Dance With Somebody” by Whitney Houston. Coach Pharrell said “That was amazing” and America should save her because there is so much texture to her voice and she has “deep ambition” in her. Ryan Sill from Team Gwen sang “More Than Words” by Extreme. Coach Gwen said she adores Ryan, and that he keeps getting better and what an incredible guy he is. All three bottom artists were brought back out onto the stage at once so that America could cast their votes to Instant Save their favorites. After the break, the votes (still being gathered), were tallied-up as Jessie Pitts with 33% of the votes, Ryan Sill at 44%, and Sugar Joans with 23% votes. By the end, Ryan Sill had gathered most of the votes and entered into the Top 10. 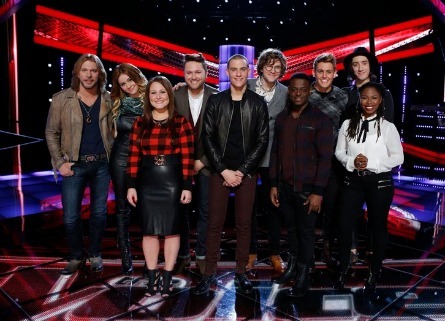 THE VOICE SEASON 7 TOP TEN! Matt McAndrew, Anita Antoinette, DaNica Shirey, Craig Wayne Boyd, Damien, Reagan James, Taylor John Williams, Chris Jamison, Luke Wade, Ryan Sill.